As part of a voluntary course offered by Rural Sociology, 16 students visited Italy to look at two different examples of global food security in action. Emmelien Venselaar, who studies International Development, has written a short blog wherein she reflects on her experiences. Happy reading. 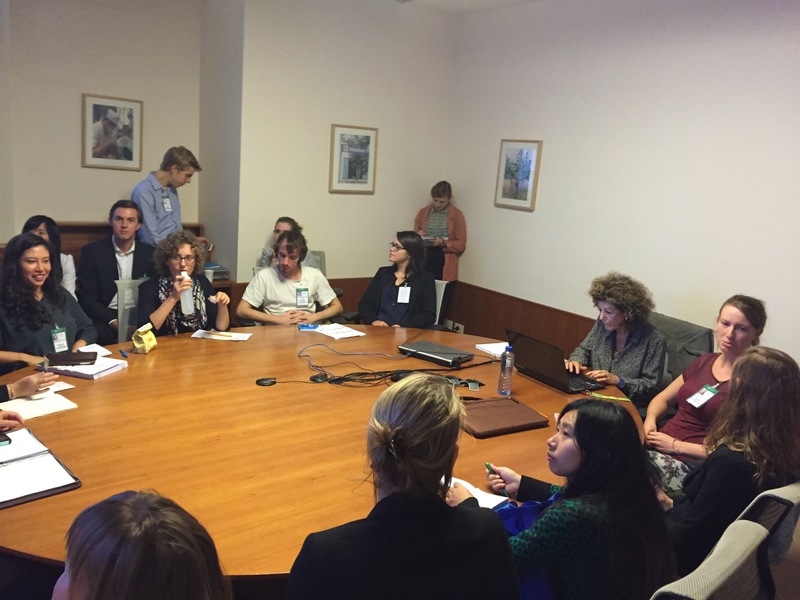 As part of the Capita Selecta “Global Food Security Governance” from chair group RSO, 16 students got the chance to visit the Committee on World Food Security (CFS) in Rome. 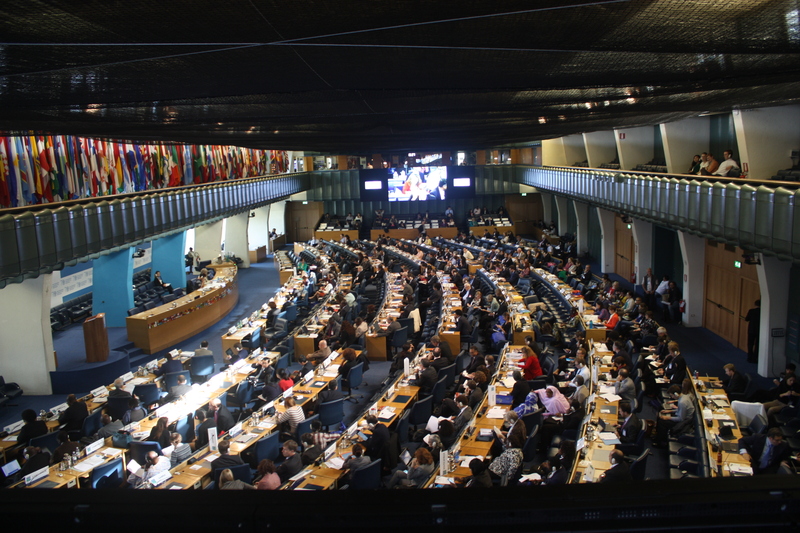 This Committee is an intergovernmental body addressing global food security governance. It aims to be inclusive and thus takes the interests of states, civil society, NGO’s and the private sector into account. In practice this means that a discussion can be conducted by Coca Cola, Finland, peasants and a representative of the FAO. This conference is an annual event hosted by the Food and Agricultural Organization, a UN agency, in Rome. During three days we experienced what is it like to formulate international guidelines at nighttime, watch African students pitch their business ideas, discuss matters over lunch on the roof terrace of the FAO office, take one minute espresso breaks to get us through the day and network our way through the side events. As students, we are quite used to short nights, networking events and important discussions. 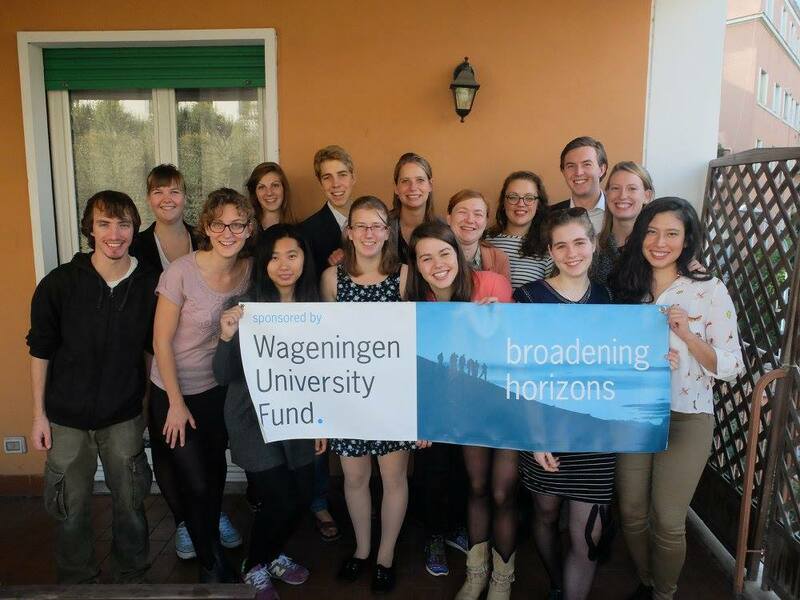 Only this time it was much more official than at our student associations or student board events back in Wageningen. This time we were talking politics. Monday night, 19.00, on the very day we arrived in Rome. We had just listened to several young entrepreneurs ready to use their business plans to improve food security. Right after this “Youth Incubator Event” the opening reception of the CFS took place. Upon entering the imposing glass and white atrium of the FAO we were impressed by all the men and women dressed up in suits. What people see as `business casual´ apparently differs per country. Outfits ranged from proper suits including fashionable high heels to African clothing. At times, this made it easier to guess what kind of stakeholder we were dealing with. Luckily we were prepared for this aspect of the network event, as we had all put on our carefully selected suits and skirts. What we were not prepared for, however, was how to approach all these delegates, keynote speakers, business men and other idols. Delegates rushed by to talk to other delegates, not even taking the time to get a drink or snack. Although their conversations seemed informal, they were most definitely talking business. It was evident that proclaiming statements and negotiation was not limited to the plenaries. This had also been apparent during the side events provided apart from the plenary session during the CFS. Often, people left the discussion only after shaking several hands and exchanging visit cards. When walking through the hallways of FAO’s complex headquarters, people will always check your visitor card to inspect your organization. As students from Wageningen University, we wore green visitor cards showing that we were “Observers”. Many keynote speakers (yellow), participants (blue) or members (red) were not as impressed with our green visitor cards as we were ourselves! Although involving youth in policy making had elaborately been discussed in several side events, we slightly felt as if our voices did not yet count. Were we skilled or educated enough to already have interesting conversations with these people? We discussed what we could talk about to the officials, not even sure if they were even interested in our student perspectives. It felt unnatural to speak to people who were more experienced in conferences than we were and who did know all the rules of the game. Despite this, we did feel that we could learn so much from these people. Just observing them already taught us a lot. It was remarkable, for example, that during the reception hardly anyone checked their phones, in sharp contrast with the plenaries and side-events. Also, the diplomats always made sure to have one hand empty of drinks or snacks to be able to shake hands whenever necessary. Speaking several languages was also a prerequisite. People felt more at ease when they were addressed in their native language. This made a discussion or negotiation lots easier. Moreover, people did not feel scared to stand alone, to look for new people to talk to. It was important to attract attention and some people walked around slowly to check for familiar faces. Lastly, everyone seemed ready for small chat, always ready to fill the occasional silence in a conversation, whether in the middle of a group or at the snack table. Our students had varying experiences during this networking event. Others, including myself, talked to fellow students from Rome who were participating in a model-like the Model United Nations. It was great to hear their experiences and views, especially after I discovered I was talking to a girl who had also represented the World Bank during their mock debate. Like us, they had also simulated a CFS discussion in class whereby different students represented different stakeholders. We discussed how we both had approached representing this stakeholder and what we had noticed during the “real” debate. We agreed that the role of the World Bank is quite controversial in the CFS and that this made our roles in our mock debates quite hard. Other students had interesting conversations with keynote speakers they had seen presenting before. They were often easier to approach because you already knew who they were. Posing a question about their speech was an easy way to approach them. Correspondingly, they were motivated to elaborate on their speeches. Another group of students spoke to the Dutch Ambassador Gerda Verburg, the Chair of the CFS (2013-2015). She seemed surprised that so many students showed up and casually talked to us. One thing we were really surprised of was that it seemed not many representatives of countries like Malaysia or Thailand joined the opening reception. We later found out that, again, language played an important role here. Countries are requested to address their statements and negotiations in the five UN languages. Apparently, this proved hard for some Asian representatives, whereas many African countries could manage. Striking, since one of the goals of the CFS is to be inclusive for all stakeholders. Being absent as a country has a great impact, since those interests will not be recognized. As an International Development student I have spent a great deal of my study learning about multistakeholder roundtables, civil society participation, platforms, processes of legitimacy, accountability and transparency. Visiting this conference finally gave me the chance to have a serious look on how these processes work in real life. We gradually got used to the “rules of the game” of the CFS and are certainly better prepared for future conferences. How vital this is was explained by former CNN correspondent Frank Sesno during one of the side events. In 2050, the year the world population will cross the 9 billion, we will be just in the middle of our lives. This entry was posted in General by foodgovernance. Bookmark the permalink. Jessica Duncan is Assistant Professor in the Rural Sociology Group at Wageningen University. Originally from Canada, she lived in France, Spain and the UK before coming to the Netherlands. She holds a PhD in Food Policy from City University London and is the author of the book Global Food Security Governance: Civil society engagement in the reformed Committee on World Food Security (Routledge, 2015, http://www.routledge.com/books/details/9781138802520/ ). Her research areas include: food policy; food security; global governance; environmental policy; participation; rural sociology. She is particularly interested in transitions towards environmentally sustainable food security governance. Last month I taught a course on global food security governance. As part of the course students were able to travel to Rome to observe the Committee on World Food Security and then Milan to check out the Milan Expo. In this blog post one of the students shares her experiences with us.